We just finished the final week of the APA Summer session here in Dallas. The 8-Ball team that I am on, Dammit Jim @ Drinks, won the division playoffs. We finished 2nd in the normal season, and won the playoffs this past Wednesday night. I played the lead-off match and won against a very good competitor. I won the final game of my match-up by playing an excellent defensive shot, resulting in ball-in-hand for me after my opponent was unable to contact one of his object balls. With ball-in-hand, I was able to put away my final ball, and got position on the 8-Ball for the win. All in all, we had a very good night and a very enjoyable match against a very friendly and great team. So; now we're eligible for next year's 8-Ball City Tournament and the possibility of a trip to Nationals in Las Vegas. So, the new Spring APA season is underway. My 9-Ball team is playing about the same as usual, which means we're playing pretty well. We won the first week, and just barely lost the second week. We're having fun and looking forward to the city tournament coming up later this year. The 8-Ball team I play on, Dammit Jim, has won the first two matches we've played so far. Of course, I'm acting as captain right now and having fun with that. This coming week, our captain, Jim, should be back in town. The "new" APA has completely revised and updated the rules, and put more responsibility in the hands of the captains, division reps, area reps, and so on than was there before. My personal take on this is that its a good thing. If everything works like they say it should, a lot of the "sand-bagging" players will hopefully just leave the league. I believe that in playing in the APA, a player should constantly strive to improve their game and advance their skill level if they can. Time will tell if the new structure will work like everyone hopes it will. Well, this week in billiards was eventful. I won my 9-Ball match against a skill level 6 player on Monday, but then lost to a skill level 6 in 8-ball on Wednesday. Regardless of win or lose, I had fun. My opponents were both very fine pool players; and I got a bit lucky during the 9-Ball game. I made a few shots that were purely luck, tinged with a bit of imperfect skill. My 9-Ball team is still the finest team I could ever ask for or want, and are generally the best bunch of people I could want to play pool with. It got cold here in Dallas this week, with snow falling on Thursday in the afternoon. Wednesday, its 75+ outside, and by Thursday morning, we're having an ice-storm... albeit a mild one compared to others I remember here. So, after a long week, I spent Friday evening over at Drinks; mostly just drinking my favorite beer and having conversations with a number of my friends there. I played one game of 8-Ball (which I just barely won), and watched some very good darts being played in the tournament there. There were a large number of people playing (over 50), most of whom I know, and a significant number of those that I had not seen in several years. All in all, a very enjoyable evening. In a few weeks, I'm heading up to Washington to spend a couple of weeks with my parents over Christmas and New Years. We're having Christmas down at the lake this year in my lake-house. This is a first and I'm really looking forward to having everyone there. This past weekend, my 9-Ball team, "Who's Next? ", played in the Dallas APA 9-Ball city tournament. We wanted to win our way to Las Vegas for this year's 9-Ball National Championships. Well, Saturday at CJ's Billiards went well for us. We won in both the first and second rounds and thereby got the third round (Saturday night) off since that was an elimination round on the loser's side of the bracket. So; Sunday morning, round 4 comes around. I'm there, along with 4 of my 7 players. One player wasn't eligible for the tournament (she joined the team too late in the session to get 10 matches in). Two players missing wouldn't normally be a problem; but they were my skill level 4 players that I really needed. As it was, with the skill levels I had at hand, I couldn't play all 5 match-ups in the round... So, we ended up getting bumped out in round 4. While Saturday is double-elimination; Sunday is single-elimination and we were out. Disappointing on many levels. Work is really difficult right now; I'm working between 12 and 14 hours a day. The project I'm on (a big one) is due to ship shortly and there are way too many things not working properly yet. We'll get it done, but boy is it a pain! Here we go again! Another season of APA billiards just started this week. My 9-Ball team played very well this week and won 61-39 over the team we played. I am generally happy with the way I am currently playing, but would like to find more time for practice. Unfortunately, work keeps me busy; and I'm also beginning to start my packing for my upcoming move back to an apartment. I joined my 9-Ball co-captain and friend Jim's 8-Ball team this season. It's different playing with a new team like this (and he signed me on as his co-captain... oh boy...). We won this week, but only on a technicality. I really hate winning that way. We were 2-2 going to the last game, and the other team had inadvertantly gone 1 point over the handicap limit. We were well into the last game before it was discovered. The league rule on this is pretty clear unfortunately, and is not very nice or forgiving. 5-0, all wins forfeited. Again, I hate to win this way. It's not really a win in my mind. It's a loss for everyone involved and not the reason I joined a pool league. We're supposed to play and have fun. Wednesday's 8-ball match was anything but fun by the end of it all. Hopefullly, things will improve over the next weeks. My 9-Ball team is looking forward to the upcoming city tournament, and our shot at getting to nationals in Las Vegas this next summer. We're having fun, and shooting well, and I think we'll do just fine. 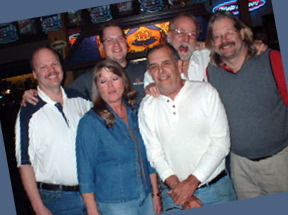 Here's a picture of my team; from left to right; Me, Canda, Nick, Dave, Jim, and Milo. Joey and George weren't there for the picture. My 9-Ball team performed nearly flawlessly this past Monday night. We won more than we lost, and had a good, fun, close match. This is the type of match I really enjoy; especially when one of my newest, and least experienced players manages to eke out a win, and manages to win the match for the team in the process. So, another match under our belt; 53-47. My 8-Ball team did pretty good, we won the first two games, but I managed to get my stick handed to me pretty solidly... I played an good player and acquaintance of mine, the captain of the other team. He's a very skillful player and worthy opponent. I played very well, just not quite good enough. We also lost the fourth game, and I didn't have a fifth player available; so we lost 2-3. Better than the week before; and not as good as we could do; I've got good players on my team. I think its just a matter of me not being a very good or motivating captain in 8-Ball. This is a problem I'll have to deal with I guess. Just not sure where to begin. Last night, my 9-Ball team, "Who's Next?" in Dallas APA took on the other 9-Ball team from our home club; Drinks Saloon. The first four of the five matches in our league match went basically like I expected; we won 2 of them, the other team won 2... that's the way most of the league matches go in this division; fairly close. The fifth match, I played against (quite probably) THE best player I've ever played against. I was somewhat nervous, but not unduly so. I looked at this match as an opportunity to both learn, and to play my game as well. The first rack started off slow, but I made 8 of the 10 points in the rack (each ball is worth a point, with the 9-Ball worth two points). The next 9 racks weren't so kind. I made 5 more points over those 9 racks, with my opponent taking the remainder, minus "dead" balls (balls going in on bad hits, or scratches. He shot 3 racks from break to the 9 while I just sat and watched. It was a pleasure watching someone so skilled at the game; I just wish he would have been playing someone else! I did get a lot of practice racking 9-Ball racks, and attempting to make shots to try to get back into the game. In the end, my opponent won the match 17 to 3, given our respective skill levels. One thing about playing someone so skilled; it's a very humbling experience. Still doesn't make it feel any better! I like to win! This week in Billiards.... what can I say? Monday, our 9-Ball team had a "bye", so no pool... most of our team showed up regardless, just to watch another match between two of the other teams in our division. Wednesday was frustrating in that we had a new schedule (again), and my team was playing short, with a number of players being simply unavailable and out of town. We (the players that were there) played as well as we could, but fell short. We had fun, but were frustrated as well. Hopefully, things will improve next week and we'll get things back on track. 9-Ball this week was fun; we lost the match, but we had fun. Excellent opponents to play against, and generally a great time. 8-Ball is the story of the week though. With the way the league is set up, the schedule for matches fluctuates and changes rather fluidly the first few weeks of the session. This session was not different than in the past in this respect. We had traveled to a new club for our week 2 match, only to have there be no opponent present. This week, with a re-shuffled schedule, I traveled there to see if the other team would be there or not. Turns out, the answer was "not", so I called the remainder of my team and let them know the news. After some time sitting there at the bar talking with a number of very nice and friendly folks, I headed back to my "home" club, Drinks, and spent the evening with some friends there, watching them play their darts match in the DDA (Dallas Darts Association) league. The pool match? Wrote it up as another forfeit; which makes 2 now, against the same "team", in 5 weeks of play... we're off to a slow start this session for sure.